Този клас самолети - турбовитлови, за регионални полети, се връща на мода, благодарение на ниската консумация на гориво и всеобщото поскъпване на цените на керосина. ATR е спечелил поръчки (за производство) на 113 самолета през 2--7 г. - рекорд з апродажби. Оборота е 1.1 млрд долара (700 млн. за 2006 г. - тия продават и ушите им се пукат!). Общият брой на поръчките в момента (тоест ероплани дето трябва да се произведат) е 195. Доставките за 2007 г. са 44 самолета (24 през 2006). В момента самолетите ATR се ползват от 130 оператора в 80 страни (и България барбар с тях - две машини вече в "Хемус"). Общо са произведени досега 757 броя от моделите ATR 42 и 72. PARIS --- On the occasion of the ATR annual press conference, which took place today in Paris, Stéphane Mayer, ATR CEO, announced orders for 113 new ATR aircraft in 2007, the record sales for a single year since the beginning of the programme. This outstanding commercial success is coupled with a 2007 turnover of some US $ 1.1 billion dollars, a growth of 56 % compared to 2006 (US $ 700 million). “This commercial record of 2007 represents a real milestone in ATR’s history, and, coupled with the announcement of the launch of the –600 series aircraft, it makes 2007 a memorable year,” stated Stéphane Mayer. ATR has booked orders for 113 new aircraft and options for 26 aircraft. 74 out of the total order intakes come from new ATR customers. 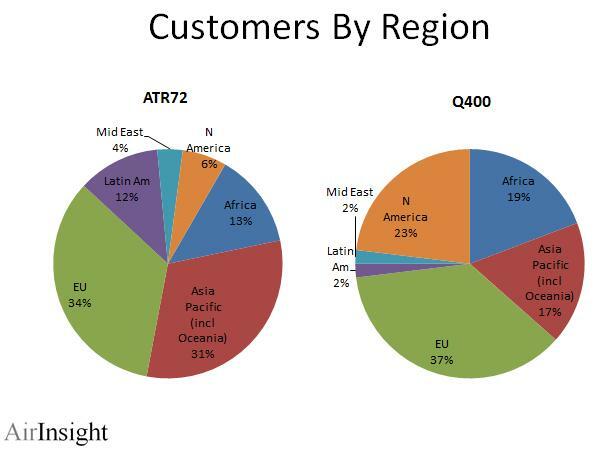 Some 52 % of the new ATRs orders of the year have been booked with carriers in the Asia Pacific region. In 2007 ATR has also expanded its commercial success to new markets such as the Philippines (10 new aircraft) and Malaysia (24), while consolidating its strong worldwide market share. Since the recovery of the turboprop market starting in the beginning of 2005, ATR has booked orders for 266 new aircraft. From the beginning of the programme, ATR has sold 950 aircraft (417 ATR 42s and 533 ATR 72s). ATR portfolio is today composed of more than 130 operators in some 80 countries. ATR has delivered 44 new aircraft in 2007 versus 24 in 2006, thus representing a production increase of over 80 %. From the beginning of the programme, ATR has delivered 757 aircraft (397 ATR 42s and 360 ATR 72s) through 31st December 2007. ATR has a backlog of 195 aircraft through 31st December 2007, an increase of some 120% compared to 2005. ATR has also recorded a strong increase in the annual turnover, reaching an amount of 1,1 US $ billion, billion in 2007. The turnover has doubled since 2005. ATR market share in 2007 is over 50% of the 50 to 74-seat turboprop market. ATR has significantly developed in 2007 its support and services capabilities worldwide. With the aim of being more reactive and closer to its customers, ATR has opened two spare parts distribution centers in Auckland and New Delhi, and a customer support center and a training center, both in Bangalore. Spare parts and services activities posted a turnover of some 209 US $ million, a strong increase of 37% compared to 2006. During 2007 ATR has also inked Global Maintenance Agreements (GMA) with 4 companies, covering more than 20 ATR aircraft. To face the challenges of the increased activity, ATR has increased its staff up to a level of 780 employees through 31st December 2007, a growth of some 13%. An additional increase is also planned for 2008. ATR plans to deliver more than 60 new aircraft in 2008 and prepare a larger production capacity in order to answer the expected market demand, while increasing its turnover over US $ 1.3 billion. In the regional market, the new turboprop aircraft has a very important and growing potential in different world regions such as Asia Pacific, Africa, Latin America and Europe. The activity is increasing with both sales to new customers and with the growth and replacement of existing turboprop fleets. There are also additional turboprop sales opportunities developing in North America. ATR will focus on maintaining its market share of over 50% and achieving between 50% and 60% of the market. Concerning the support and services activities, in 2008 ATR is establishing a new MRO policy. Under this project, ATR will recognise certain MRO providers in key areas of the world, to provide guidance and ensure the best quality of maintenance to the family of ATR operators. In 2008, ATR’s customer support will also be launching a “door-to-door” service, while enhancing its technical support worldwide. At the same time, ATR is evaluating further developments of its regional policy launched in 2006, with a larger presence in the world. This mainly includes new spare parts distribution centers and training centers in current and future key zones, such South America. According to its principle of continuous innovation, ATR is generating important results in 2008 on maintenance cost reductions. In order to enhance the competitive advantages of the aircraft, ATR is currently working on the optimization of the maintenance procedures, thus allowing an extended time, in flying hours, between the C-checks. ATR is also planning an extension of the time between the landing gear inspections and between the propellers checks. In a world that is more and more concerned about sustainable development and global warming, and where authorities are moving to implement drastic measures (for example, the European Emission Trade Scheme has been extended to the aeronautics), ATR is the “Green Player” of the regional market. On a 200 Nm, the fuel consumption per passenger of an ATR 72 is about 15% less than a European standard car and 60% less than a 70-seater jet. These figures appear even more important when related to gaseous emissions: 1 tonne of burned fuel represents 3 tonnes of CO2 into the atmosphere. Toulouse, Southern France-based regional aircraft manufacturer ATR is the world leader in the 50 to 74-seat turboprop market. ATR is an equal partnership between Alenia Aeronautica (Finmeccanica group) and EADS. Bombardier’s popular Q400 turboprop is emerging as a top performer when it comes to reducing the environmental impact of aircraft. Representatives from Bombardier Commercial Aircraft and Horizon Air chose today, Earth Day, to reiterate the 78-seat Q400 aircraft produces 30 percent less emissions, can be more fuel efficient than an average car (when calculated on a per passenger basis) and, both inside and out, is one of the quietest aircraft in the world. Recent sales growth of the Q400 aircraft point to the aircraft’s popularity among airlines seeking not only to reduce environmental impact but to realize economic benefits, particularly around fuel efficiency. During the fiscal year ended January 31, 2008, Bombardier Aerospace took orders for 80 Q400 airliners compared to 24 orders in the previous year. Sales of turboprops in general have risen along the same upward curve of jet fuel prices since earlier this decade. Horizon Air, which has purchased 33 Q400 aircraft with another 15 on order and 20 options, is one of several carriers around the world to promote the reduced environmental footprint of its fleet. The Seattle-based airline goes even further by touting the convenience and low-stress benefits of air travel versus automobile travel between Seattle and Portland, its most heavily traveled route. “The Q400 turboprop not only saves us money, but allows us to reduce our carbon footprint while shuttling customers between Seattle and Portland, and on other routes quickly and comfortably,” said Dan Russo, Director Marketing and Communications, Horizon Air. “In terms of economics, environment and profitability, our Q400 aircraft sales are increasing dramatically as the industry moves forward on the path of sustainability,” said Rod Williams, Vice-President, Commercial Operations, Bombardier Regional Aircraft. Bombardier’s engineers have focused their efforts on both the internal and external environment. The Q400 aircraft features a revolutionary Active Noise and Vibration Suppression (ANVS) system that reduces the vibrations in the fuselage, stopping much of the noise and vibration from entering the cabin. The low noise levels should be no surprise; after all, the “Q” in the Q400 stands for quiet. As one of the quietest commercial aircraft in existence, the Q400 aircraft is able to operate in noise-sensitive areas such as the island airport in Toronto and London’s city airport. The Q400 aircraft exceeds not only current environment standards but also anticipated ones, with respect to carbon dioxide (CO2), hydrocarbon, nitrous oxide and smoke emissions. All are well below the levels mandated by the International Civil Aviation Organization (ICAO). For example, on a 500-nm or 575.4-mile trip, the Q400 aircraft emits 30 percent fewer emissions and rates among the lowest CO2 emitting aircraft on a per seat basis. 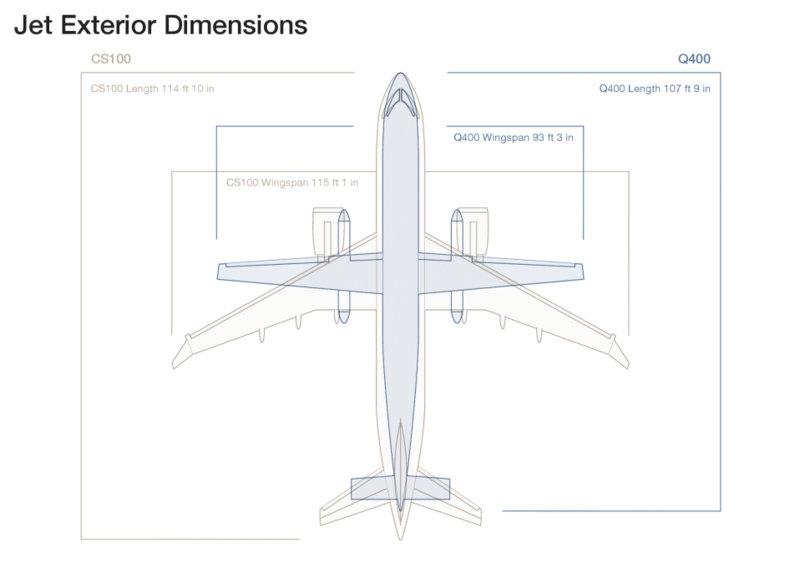 Looked at another way, each Q400 aircraft produces 3,000 fewer tons of CO2 every year. The new Q400 NextGen turboprop airliner is the next step in the continuing evolution of the Q400 aircraft. Revised in the same spirit as the CRJ NextGen aircraft family, the Q400 NextGen aircraft remains one of the most technologically advanced turboprop aircraft. As with the CRJ NextGen aircraft family, the overall cabin environment of the Q400 NextGen aircraft will be enhanced with the introduction of LED lighting, new ceiling panels, dished window sidewalls and larger overhead bins. Combining these features with the Active Noise and Vibration Suppression (ANVS) system will give the Q400 NextGen passenger an even more pleasant cabin experience. Bombardier достави на Хърватия първия от четирите договорени на 4 юли 2007 година турбовитлови Q400 . Achtung написа: ....Изглежда АТР печели състезанието при "перките"
В последните години се очертава баш тъй. Твърди се категорично, че е така....А ако говорим за собствен опит, аз голяма разлика между комфорта на Q400 и АТR (старите версии) не намирам. Особено що се касае за шума в кабината (едно от най-рекламираните предимства на Q400) – в определени моменти си е пак жива резачка, но мнението ми до голяма степен може и да е субективно. Чел съм няколко анализа. Според тях, АТR е категорично по-икономичен от Q400 на късите линии, но при дългите (и все ще в обхвата на АТR) малко по-добре се представя втория. Работата е там обаче, че повечето АК ползват турбопропа за къси (понякога много, ама много къси линии), като изключение пряват в случая Канада и САЩ (където наистина Q400 е по-полулярен). Това до голяма степен обезмисли надцакването на база „скорост/обхват”. Като се прибави и факта (ако се не лъжа), че АТR имат и предимство по отношение пробег/разбег (къси писти) а и на всичкото отгоре е и „по-ефтенджос”, самолета като че ли без да иска, взе да става все по на мода (в началото на века се предполагаше, че Q400 е с едни гърди напред и АТR бая се замисляха дали изобщо да ъпгрейдват основните си версии 42 и 72 или направо да пристъпят към нова разработка). Изобщо локална мрежа FB почти няма и адекватна утилизацията на един или два (да не говорим за повече) турбопропа към настоящия парк би била затруднена. Всъщност доколкото знам FB все още има в парка си един ATR (или поне имаше преди около 2 години - лично аз съм летял с него по линията BOJSOF с него, макар че поразписание трябваше да се лети с Bae146), но мисля, че той изобщо не се използва вече за редовен превоз. А и късите линии, не означават непременно ниски цени – напротив – често цените са неадекватно високи. Давам конкретен пример – полета ми ATHJMK (Атина-Миконос, превозвач A3 – Aegean Airlines) струваше EUR185 – с около EUR50 повече отколкото SOFATH (София-Атина, превозвач ОА – Olympic Air, вече субдивизя на Aegean Airlines). Същото ми се случи и при полет BCNIBZ (Барселона-Ибиза) – цената надхвърля тази на полета SOFBCN (София-Барселона), макар че се фърчи буквално минутки..... Дали летищните такси са причина за това, дали пазара – не знам, но нискотарифните превозвачи по принцип избягват къси дестинации – явно от тях голяма далавера нямат. Не е време Bombardier да мисли за ъпргрейд на Q400 – варианта е все още сравнително нов (не и платформата обаче). За нов модел и дума да не става – всичките ресурси на производителя са впрегнати все още в CS300 (макар и да е наличен отдавна EIS) и евентуалният СS500. 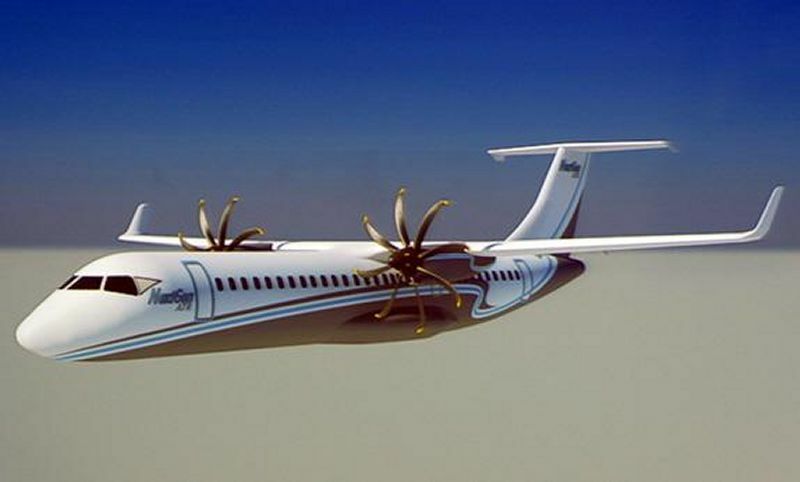 На Q400 обаче му е много трудно отдавна – АTR победи. Нещо трябваше да се направи. Пари за друго няма, но поне интериора можеше да бъде барнат, по начин, че да се увеличи вместимостта (оттам и икономичността). Bombardier се постара да предложи и комби вариант (пътнически / карго) в усилията си да вдигне продажбите модела, като последният цели основно продажби в Аляска и северните територии на Канада, където има деманд за карго при сравнително не толкова дълги линии. Има надежда, и че част от превозвачите опериращи с най-старите версии (100 и 200) на джета CRJ, могат да решат да го заменят с турбопропа Q400 (при новата вместимост). Не всички обаче са особено възторжени. Промяната в конфигурацията няма как да не е за сметка на нещо друго, при положение, че самолета де факто, си е един и същ. Очевидно се премахва предното багажно отделение, което вероятно не се ползва особено често (или така се предполага). Увеличеният брой пътници (тегло), сигурно ще посмъкне и рейнджа, но тук Q400 има големи резерви и едва ли ще има проблем (казано директно – няма да има). Комфорта при Q400 също не е кой-знай какъв, увеличеният брой места едва ли ще го подобри. Успеха на новия комби вариант (има и стар такъв, но той е на DHC-8-300, не при версия Q400) също не е гарантиран. Не се знае дали увеличеното тегло няма да изисква и по-дълги писти, а тези в Аляска и Северните територии по принцип винаги са много къси (една от причините самите канадците да купуват ATR). Q400 по принцип не е евтин и освен Alaska Airlines/Horizon мющерии не е сигурно, че ще се намерят (не, че Alaska/Horizon са в кърпа вързани де). А и не толкова отдавна самия Bombardier стартира програма за удължаване на живота на класичестите DHC-8 (версии 100 и 300), като по този начин последните да могат да се ползват още около 20 години. След като Airbus и Bombardier се сдушиха (покупката на мажоритарния дял от акциите на С-серията), съвсем актуален стана въпроса има ли шанс за сътрудничество по отношение на турбопропа, тоест какво следва след Q400 (DASH-8) и АТ4/7 (ATR 42 и ATR72). Както е известно, Airbus владее и 50% от акциите на ATR. Известно е и друго – че докато Leonardo е склонен към чисто нова разработка, в Airbus са доста по-консервативно настроени и считат, че засега нужда от такава няма, тъй като платформата има все още потенциал. Това донякъде е оправдано, предвид факта, че производствената линия на АТ4/7 (във версии 600) е ангажирана за години напред, докато Q400 може да се похвали едва с 31 поръчки. И все пак, нито едната, нито другата платформа са в тийнерджърски години, дори и да не е веднага, в един момент трябва да се помисли сериозно за замяната им. Концепции много, появили се още преди дяловата покупка на С-серията. Критиците обаче са още повече. Фюзеляжа и най-вече крилото на CS са оптимизирани за скорости над Mach 0.8, а също така и за take off при значително по-високо MTOW. Това означава минимум ново крило. А ново крило (както каза веднъж един колега форумец) – нов самолет. Дори и при фюзеляжа няма как да се мине само с преработка, тъй като той пък е оптимизиран най-вече за по-тежкия CS300 (а не CS100, макар и последният да се води базов модел). подобен подход не изглежда особено вероятен. но по-важното в случая е, че Ербъс не се е тръшнал да даде ход на проекта. Така или иначе и двете платформи са достигнали лимита на stretch, нови ъпргрейди в това отношение едва ли ще са успешни. 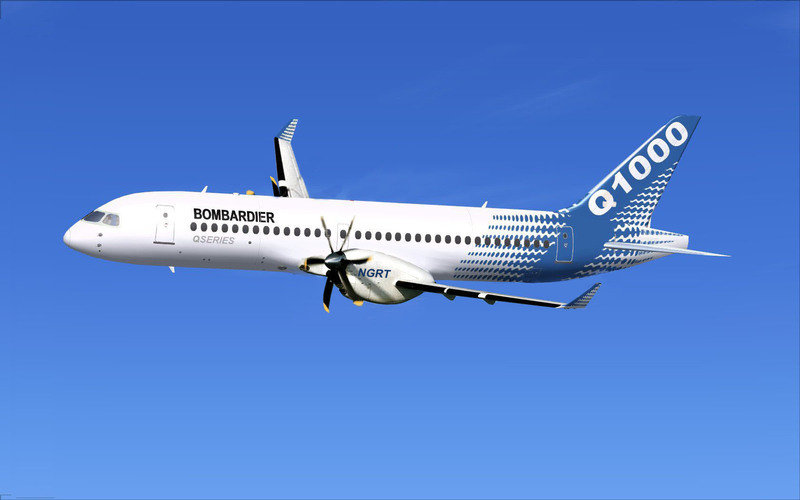 Q400 си остава 100% собственост на Bombardier. Предвид дяловия пазар (преимуществено в полза на ATR), по-голяма заинтересованост за евентуално JV би трябвало да има Bombardier, отколкото Airbus. Липсата на сериозна конкуренция от трети производител обаче навява на мисълта, че едва ли в скоро време ще ни зарадват със clean sheet модел.